High school blood drives are fun and creative! Giving blood during school years helps start a habit for a lifetime. High schools play a vital role in the health of our community. Community Blood Center of the Ozarks holds drives at more than 150 area high schools, with many schools holding three or more drives per year! 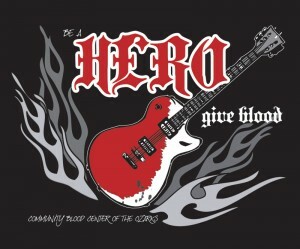 Almost one-fourth of the blood collected for patients in our community comes as a result of high school blood drives. Students are in charge of their own drives, from planning to execution. These student leaders will select a theme for the drive and may design and order promotional materials based on the theme. CBCO Donor Recruitment representatives will provide some tried and true ideas and answer any questions. CBCO offers awards, grants and scholarships to high schools, depending on their level of participation in the donation program. Student groups may hold competitions with rival schools to build participation. Find out how you and your school can become a part of our Graduate with Honors program. When you conduct a drive, you’ll learn leadership skills, organizational skills, communication skills, and provide worthwhile community service. Learn all about organizing your high school blood drive at our annual Leadership Workshops or take a look at our blood drive handbook. Sign up for our innovative donor rewards program, LifePoints and begin earning points toward great prizes! At age 16, donors must have the written consent of a parent or guardian to donate blood. Students may download a copy of the form to have parents sign before the blood drive.